Beginner remote control (RC) tanks are great for all skill levels. Our tanks have great features such as real smoking engines, motor sounds, and working turrets. You can mount a wireless camera on your tank to go on a real mission to hunt down your enemy. Looking for more tank fun? Buy an RC battle tank today and start having fun tomorrow. 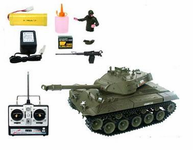 Shop the best RC tanks, RC helicopters, and remote control trucks for sale.